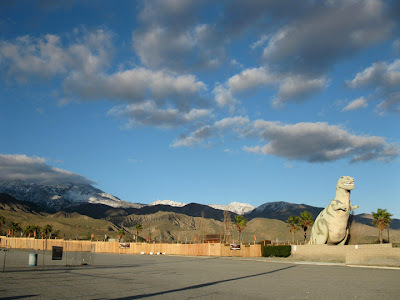 You can see Dinny, right, and Mr. Rex from Interstate 10 as you take the Cabazon exit. 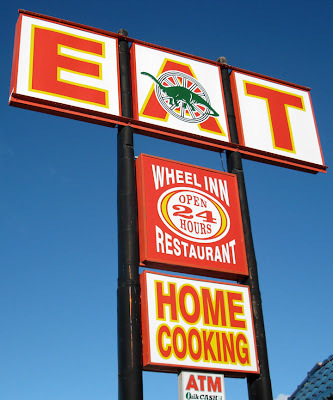 The Wheel Inn Cafe's owner was looking for an attraction to lure people off the highway in 1964. The dinosaurs did the trick. There are two kinds of people in the world: those who "get" "Pee Wee's Big Adventure" and those who don't, and I'm not sure I can be friends with someone if they don't. Alright, that's a bit harsh, but I firmly believe if there was justice in the world of entertainment, "Pee Wee's Big Adventure" would win a Best Picture Oscar every year. We were lucky enough to be passing by one of the backdrops of this epic opus while visiting California recently. 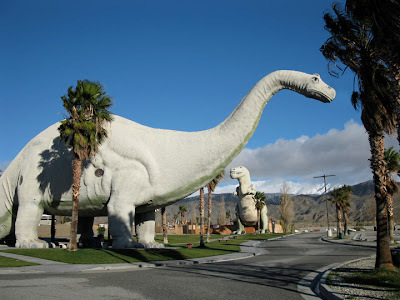 The Cabazon dinosaurs figure prominently in the scene where Pee Wee and Simone spend an evening together and are then chased by Simone's jealous boyfriend Andy. 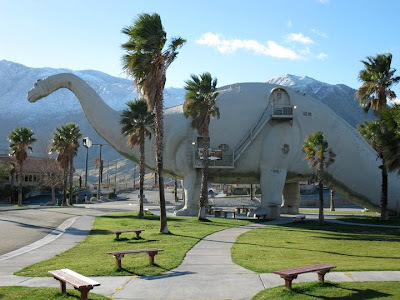 Claude K. Bell created the dinosaurs to attract attention to his Wheel Inn Cafe at the Cabazon exit off of Interstate 10. Construction began on the first dinosaur, "Dinny," the one one that looks like the Sinclair gas logo, in 1964 and was eventually completed 11 years later. 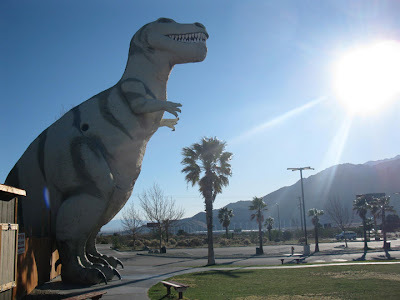 The second dinosaur, "Mr. Rex," was completed much later in 1981. 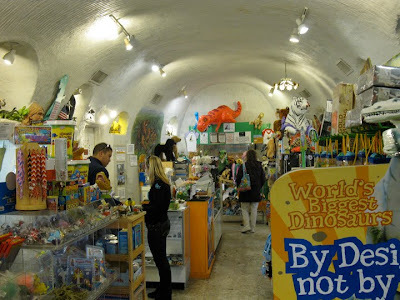 Dinny has a gift shop inside of him and the inside of Mr. Rex can also be toured. Mr. Bell died in 1988 and the dinosaurs' current owners have spruced up the place with some nice landscaping and a parking lot. 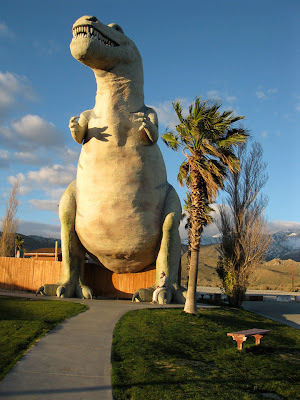 The current owners have also added a twist that puts them in the eccentric roadside attractions hall of fame: a dinosaur park with a creationism theme. 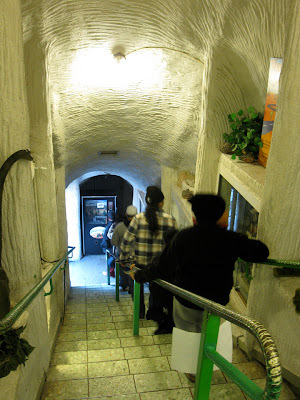 The current owners are "Young Earth" followers, believing most dinosaurs were created on earth 6,000 years ago to coincide with Adam and Eve and the Garden of Eden. The Dinny gift shop has dioramas of both an evolutionist (Mr. Bell's originals) and creationist nature. Who knows... maybe "The Flintstones" got it right after all. Sonny gives a big smile to a down-on-his-luck fellow fishing out coins. 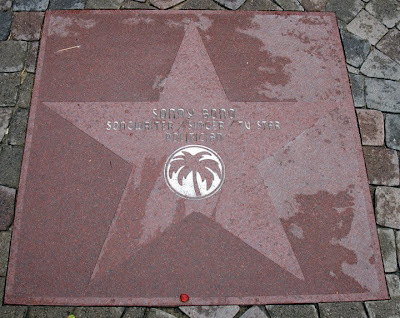 Sonny's Palm Springs Walk of Fame star was moved to a prominent location in front of his statue. 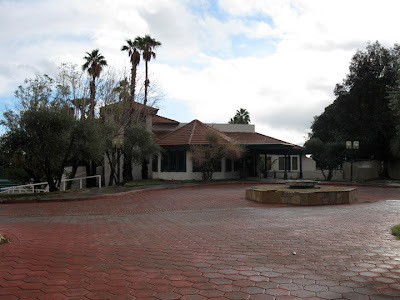 Sonny's Palm Springs restaurant, Bono's, sits vacant today. 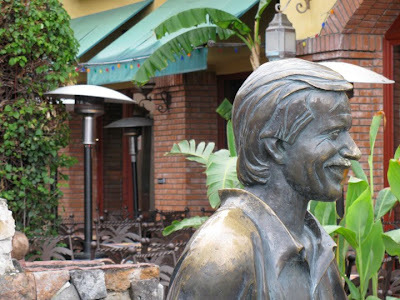 Sonny Bono was an entertainer, songwriter, entrepreneur and the not-Cher half of Sonny and Cher. His showbiz career began by working with Phil Spector and co-writing the 1960s hit "Needles and Pins," then successfully partnering with Cher on records and TV, then solo work including more guest appearances on "The Love Boat" in the '70s than any other celebrity (by his own admission). 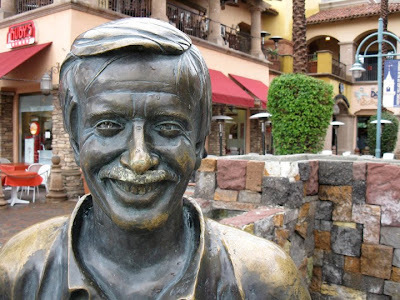 Frustrated with zoning laws while trying to open a Palm Springs restaurant in 1988, he ran for mayor and won, serving until 1992. He later went on to represent his district in the U.S. Congress for four years until his untimely death at age 62 from a skiing accident (his widow Mary still holds his seat). 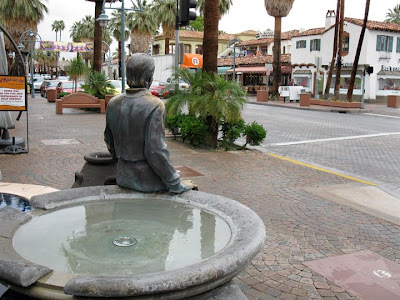 He was a pro-business Republican and helped create the Palm Springs International Film Festival, still being held today in his honor. 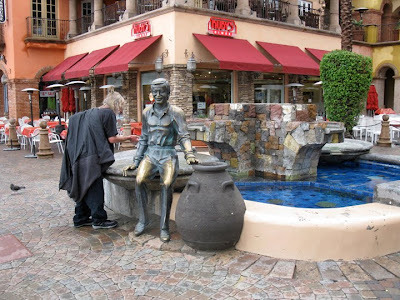 In 2001, the city paid tribute to him with a bronze statue in the heart of the downtown shopping district at Plaza Mercado on South Palm Canyon Drive. 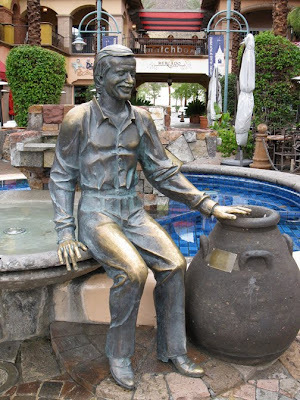 There he sits with a big grin by a coin fountain looking out at his constituents in a puffy open-collared shirt and high-waisted pants, proving it's forever Sonny in Palm Springs. 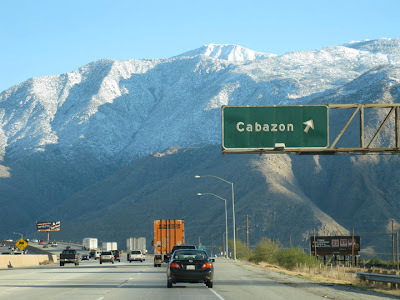 After five days of record-breaking rain and flooding in the Palm Springs area, we had a gloriously sunny day today, our last before driving back to Phoenix tomorrow. 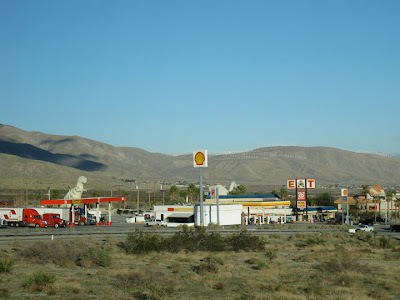 We didn't waste it either, with a long drive to see the many eccentric roadside attractions through the region, including the "Pee Wee's Big Adventure" Dinosaurs, the Rialto Wigwam motel, the world's biggest paper cup of Riverside, the International Banana Museum in Hesperia and chunks of Route 66. Whew! 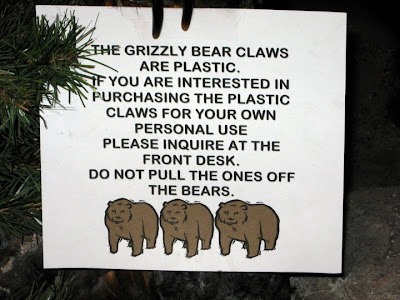 There's eccentric travel, and then there's really eccentric travel. 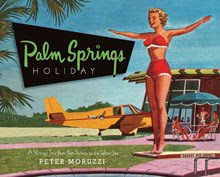 Like flooding in a desert; namely, Palm Springs, California, a region known for a sunny, dry climate 360 days a year. Southern California is in the midst of a freak-of-nature series of storms causing more rain to fall in a couple of days than normally falls in a whole year, and we're here to take it all in. We did get a good part of a day to look at the awesome mid-century modern architecture so abundant here, and things should clear up by the end of our stay. And if not, I hear Tornado Alley is lovely this time of year. 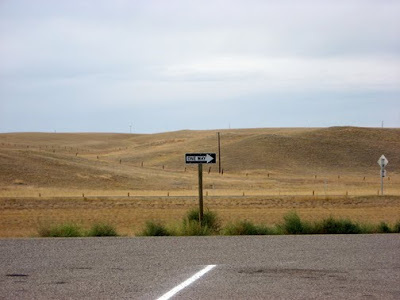 This was a big day for us at Eccentric Roadside for two reasons. 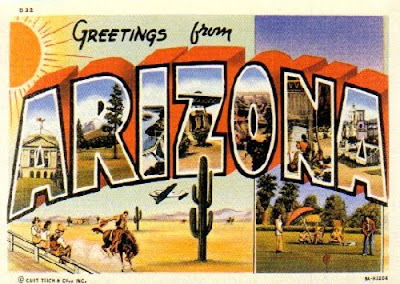 Firstly, we spent the day driving around the awesome state of Arizona, starting in Tucson, then down to Bisbee, and then up to Tombstone. Secondly, I turned a half-a-century today, and if you have to get old, you might as well do it in Tombstone, "the town too tough to die." 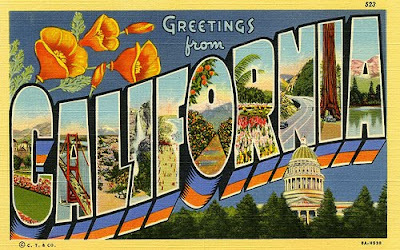 I've got a lot to be grateful for and as Frank Sinatra once sang, "the best is yet to come and babe won't it be fine..."
We're about to head out on another eccentric roadtrip, this time to the beautiful southwestern USA. We'll make as many dispatches as we can through the courtesy of motel lobby computers, as we still don't have a laptop. See you when we get back! I try to appreciate every little thing on a roadtrip from the most spectacular scenery down to the most banal little detail. 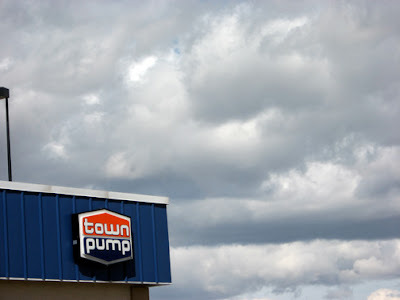 It's good to take a minute every so often to appreciate the mundane and melancholy places that the rest of the world seems to be passing by that are all part of the glorious eccentric roadside experience. 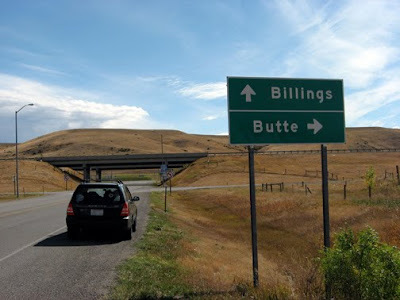 Montana has more than its share of jaw-droppingly exquisite sights. 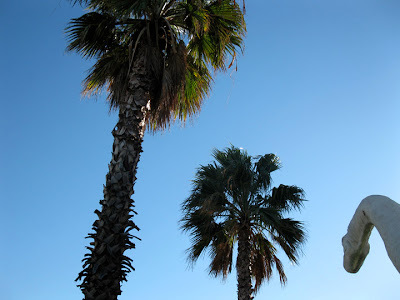 Why, the sky alone is a tourist attraction. But in between the feast-for-the-eyes are a few enchantingly dull scenes. At least I think so, anyway. 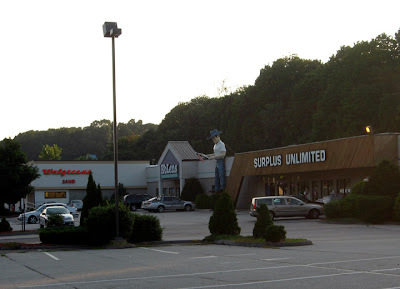 An unassuming strip mall in the southeastern Connecticut town of Norwich is the unlikely home of a towering fiberglass cowboy, perched between Eblens casual clothing store and the Surplus Unlimited. 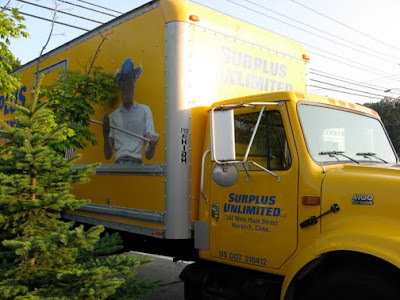 Surplus Unlimited adopted the cowboy as its logo and had him painted on the sides of a large truck parked in front of the store when we visited last summer. 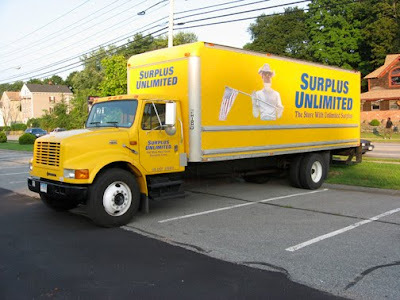 Bravo to them for having such a cool incongruent corporate mascot. Great deals on flashlights, too. ...and how it looks today. Holy Mackerel! 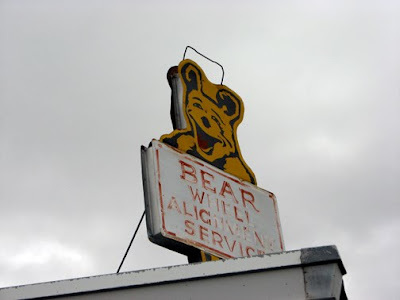 One of the thrills of traveling the open road in search of eccentric roadside attractions is stumbling upon an unexpected awesome vintage place. 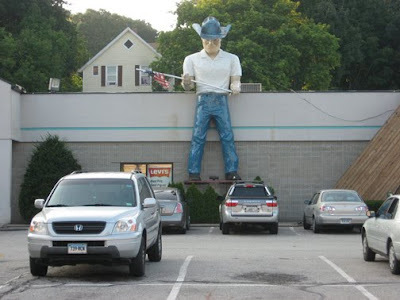 This happened to us back in 2006 while cruising down Route 2 in northern Minnesota when we spotted the Big Fish Supper Club in the small town of Bena. 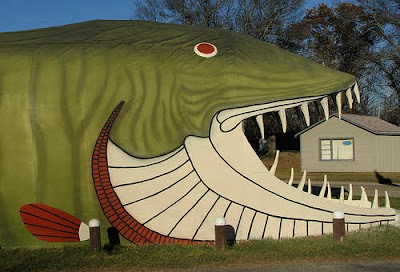 It was a fantastic 65-foot building in the shape of a gap-mouthed muskie on the grounds of a lake-front cabin retreat. 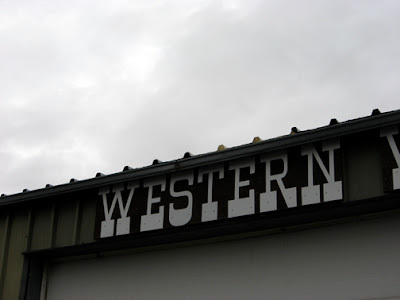 It was built the 1950s and showing signs of its age, which only added to its roadside charm. Some recent web surfing led me to an item of great joy. The Big Fish has been beautifully restored. So much of the time places like this either rot away or are demolished that it's a modern miracle someone would put the love and attention (and bucks) into bringing a roadside gem like this back to its former fishy glory. The whole place is up for sale so apparently the owners want to put their best foot, or fin, forward. 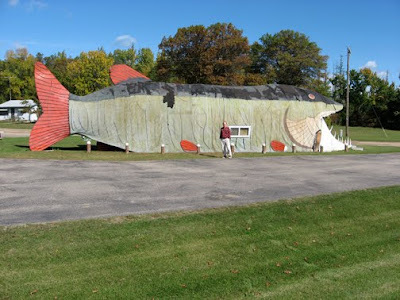 This is a picture of the newly refurbished "Big Fish" statue in Bena, MN. 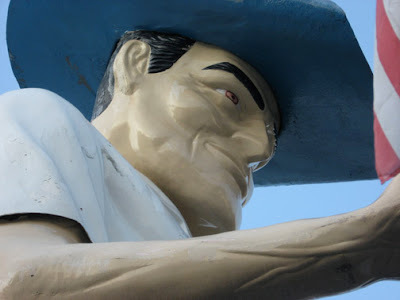 I was hired to repaint the statue. The interior structure was rebuilt by the current owners. The fish, restaurant and cabins are all up for sale. Kudos to you, Josh, for putting your heart and sole into a job well done. On a "scale" of 1-10, this is an 11. 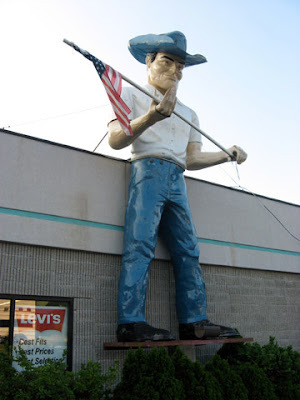 Let's hope they find a buyer for this magnificent roadside attraction. Cod knows we could use more plaices like this while driving down the pike.